This is an unusual war memorial, as it has served to commemorate two different sets of men. It now remembers the Wheatley men who died in the two world wars, but it originally stood in Magdalen College's Old Quadrangle where it remembered their members who died. 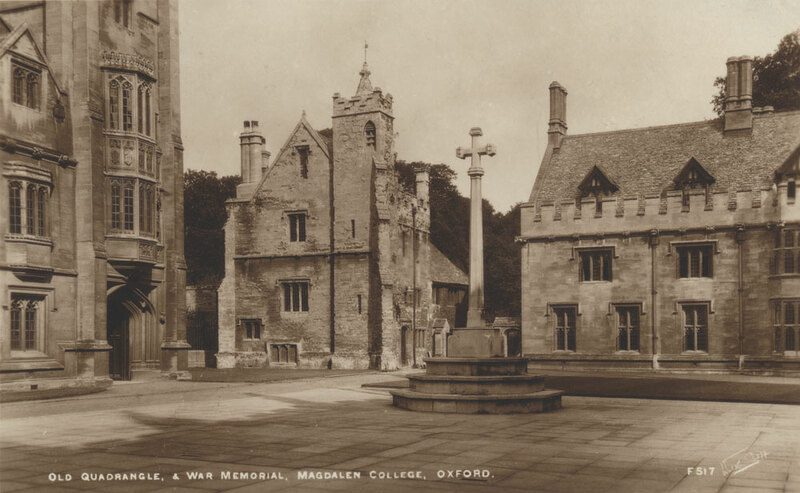 The Magdalen College war memorial cost £1,000, and the additional cost of paving the quadrangle (which had previously been a lawn) was £2,000. It was unveiled by the Prince of Wales on 8 February 1921, and a photograph (above left) appeared in The Times the following day. Historic England stated that it is made of limestone, while the Imperial War Museum believes it to be made of Portland Stone. It comprises a Greek cross with ornamented arms on an octagonal shaft and plinth, which in turn stands on a two-stepped octagonal base. It was designed by Alfred B. Yates. A photograph of stonemasons completing this memorial at Magdalen College appeared in the Oxford Journal Illustrated on 24 November 1920 (p. 12), followed by a photograph of the painter putting the finishing touches to the list of names on the plaque in the cloisters on 13 April 1921 (p. 4). Robert Gunther, a Fellow of the College, did not like it, describing it as “a phallus with a silly little cross at the top”. The front of the plinth was originally inscribed simply MCMXIV in the centre (and presumably MCMXVIII at the back), and the names of the Magdalen war dead were listed on plaques in the Cloisters. 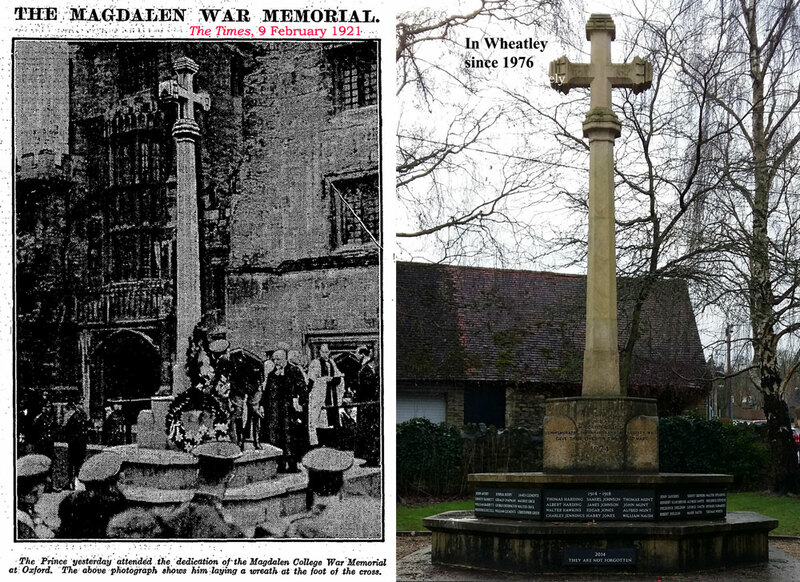 Meanwhile Wheatley's original war memorial was unveiled on 12 June 1921, and three photographs appeared of the unveiling ceremony in the Oxford Journal Illustrated on 15 June 1921 (p. 9). This memorial was demolished in the 1970s. Magdalen's cross was then moved to the Old Burial Ground, Bell Lane, Wheatley and was rededicated in October 1974 to commemorate the servicemen from that village who had died in the First and the Second World Wars. Their names are listed on slate plaques attached to the octagonal base (see below): they are incised and painted white. In the 1980s the cross was snapped off by vandals, but it was restored six months later. In 2014 the War Memorials Trust gave a grant of £1900 to steam-clean the memorial, repoint the open joints using lime mortar, and repaint lettering that had deteriorated on the plaques and panels. From War Memorials Trust perspective it is unfortunate that at some point after works in 2014 an additional plaque was added commemorating 2014 as a centenary year. War Memorials Trust does not believe it is appropriate for plaques to be added to war memorials that do not sympathetically reflect the original purpose of the memorial in question. This is because the intended purpose of the memorial is changed by such additions. War memorials provide a focus for commemorating those who have fought or fallen in a conflict and this importance should not be detracted from through unsympathetic additions. It is also important to remember that the addition of such plaques on a regular basis is unlikely to be sustainable as space on a war memorial is limited. Such works are not eligible for funding and can be excluded from potential works within grant offers. GAVE THEIR LIVES IN TWO WORLD WARS.